The number of Tetrastischus howardi (Olliff) females to be released and their dispersion should be known, that way, used D. saccharalis pupae as sentinel host to measure parasitism as function of the release density of the parasitoid and its location in the field. Two sets of trials were run aiming first to define the number of parasitoids to be released and the dispersal of the parasitoid using plots in sugarcane commercial fields, respectively. Pieces of sugarcane stalk holding sentinel pupae were taken to the field and exposed to parasitism in both trials. The parasitoid was released at the rate of 20, 40, 80, and 160 females per sentinel pupa, except for the control plot without releasing. The parasitism rate was calculated based on the recovered pupae after 96 h of exposure time from releasing the parasitoids. The models estimated the best parasitism rate by releasing 102 parasitoids per pupa. In the second trial, sentinel pupae were arranged in five subsequent circles corresponding 4, 8, 12, 16, and 20 m around the central parasitoid releasing point at rate of 4, 8, 12, 16, and 18 pupae per circle. The mean estimated dispersal distance was 7.64 m, with a covering area of 80.07 m2. 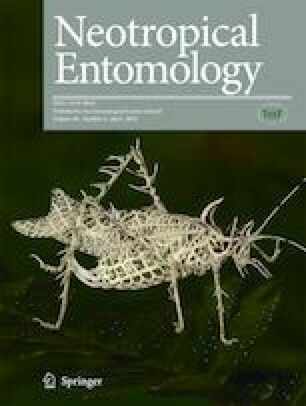 Based on these findings, release of T. howardi is recommended in 125 points per hectare of sugarcane at rate of 102 females per pupa of the pest aiming to achieve homogeneous distribution and parasitism. The authors acknowledge “Usina Santa Helena” and “Usina Monte Verde” for technical support. RHB, FFP, AVAM, SOK, and PLP planned research; RHB, FFP, SOK, and CR conducted experiments; CR, JBT, and RMMFS contributed material and conducted data analyses; RHB, FFP, and AVAM analyzed data and conducted statistical analyses; RHB, FFP, SOK, JBT, and PLP wrote the manuscript; FFP, JBT, RMMFS, and PLP secured funding and additional support; and RHB, FFP, AVAM, SOK, CR, JBT, RMMFS, and PLP read, suggest, and approved the manuscript.